Photo from WCSH6 story on 2/25/17. Casco Bay High teacher, Ekhlas Ahmed, a refugee from Darfur, Sudan came to the United States with her family when she was 12 years old due to the Darfur Genocide. 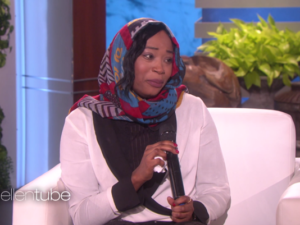 We applaud her strength and commitment to education and congratulate her on being noticed by Ellen who was so moved by her story, she paid off Ekhlas’ student loans. See the inspiring story on WCSH6.